Life with the bike was often a frenzied schedule of public appearances, and long before I figured out that I could charge real money for speaking gigs, I counted on casual events like this to meet interesting people and maybe sell a few books. I think this was my first visit to the Apple Computer campus (Mariani building). Actually, I find this kind of funny, given Apple’s brilliance in desktop publishing tools… one misspelling in the title and a crooked paste-up. But a good time was had by all! Q. 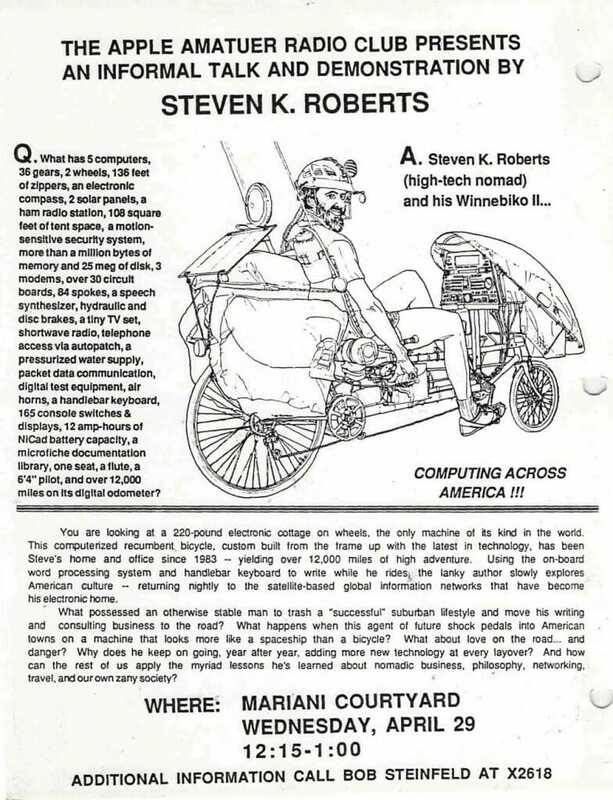 What has 5 computers, 36 gears, 2 wheels, 136 feet of zippers, an electronic compass, 2 solar panels, a ham radio station, 108 square feet of tent space, a motion-sensitive security system, more than a million bytes of memory and 25 meg of disk, 3 modems, over 30 circuit boards, 84 spokes, a speech synthesizer, hydraulic and disc brakes, a tiny TV set, shortwave radio, telephone access via autopatch, a pressurized water supply, packet data communication, digital test equipment, air horns, a handlebar keyboard, 165 console switches & displays, 12 amp-hours of NiCad battery capacity, a microfiche documentation library, one seat, a flute, a 6’4″ pilot, and over 12,000 miles on its digital odometer? A. Steven K. Roberts (high-tech nomad) and his Winnebiko II… COMPUTING ACROSS AMERICA!!! You are looking at a 220-pound electronic cottage on wheels, the only machine of its kind in the world. This computerized recumbent bicycle, custom built from the frame up with the latest in technology, has been Steve’s home and office since 1983 — yielding over 12,000 miles of high adventure. Using the on-board word processing system and handlebar keyboard to write while he rides, the lanky author slowly explores American culture — returning nightly to the satellite-based global information networks that have become his electronic home. What possessed an otherwise stable man to trash a “successful” suburban lifestyle and move his writing and consulting business to the road? What happens when this agent of future shock pedals into American towns on a machine that looks more like a spaceship than a bicycle? What about love on the road… and danger? Why does he keep on going, year after year, adding more new technology at every layover? And how can the rest of us apply the myriad lessons he’s learned about nomadic business, philosophy, networking, travel, and our own zany society?